Established for some time is CYCLOMUNDO that maintains an ebay store here. 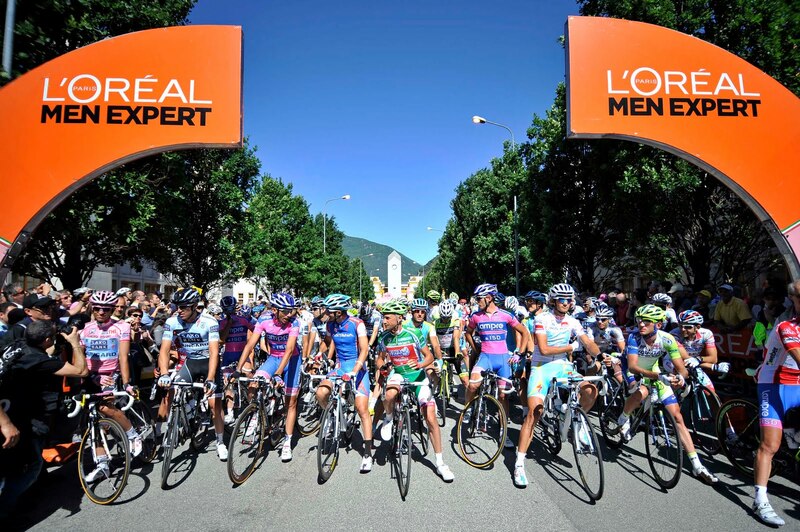 Star Production SARL, a Monaco based company owning the Star Events and StarTour labels, has purchased Gran Fondo USA which established the Granfondo Colnago series beginning in 2009. Gran Fondo USA was founded in 2008 by Matteo Gerevini and Rob Klingensmith who launched operations in 2009 with a Gran Fondo San Diego, the first Gran Fondo in the United States. “The success of our rides comes from our attention to details and our strong commitment to the ‘Made in Italy’ theme,” says Gran Fondo co-founder Matteo Gerevini. “We are proud of this partnership with Star Production, which will bring our operations to a new level and enable us to expand the series to other major cities in the coming years.” The Gran Fondo USA 2011 season includes San Diego, which was completed in April, and upcoming rides in Los Angeles (June 26), Philadelphia (August 14), and Miami (November 20). Stage 21, Sunday, May 29, 2011: FIERA MILANO (RHO – PERO) - MILAN, 26 KM individual time trial. 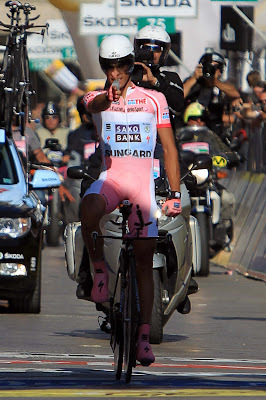 Alberto Contador (Saxo Bank Sungard) is the winner of the 94th Giro d’Italia and the Maglia Rosa Estathé 2011, 6’10” ahead of Michele Scarponi (Lampre – ISD). Vincenzo Nibali (Liquigas – Cannondale) came third after 6’56”. 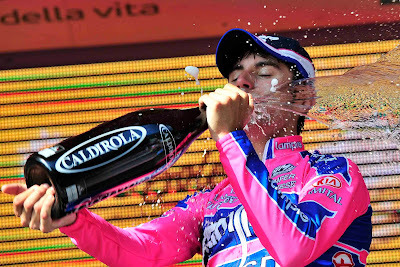 Alberto Contador (Saxo Bank Sungard) is also the Maglia Rosso Passione Gruppo Saint-Gobain 2011. 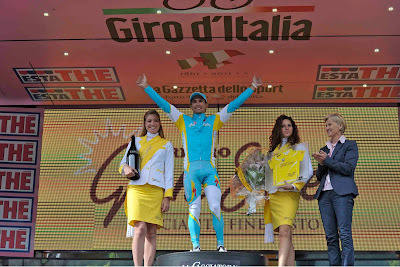 Roman Kreuziger (Pro Team Astana) is the Maglia Bianca Adecco 2011. Stefano Garzelli (Acqua & Sapone) is the Maglia Verde Banca Mediolanum 2011. David Millar (Team Garmin Cervelo) won the final stage. 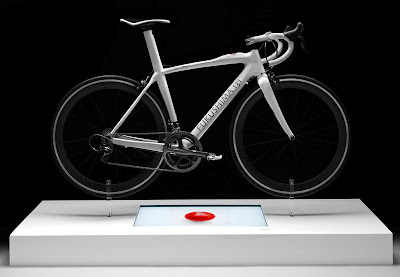 The winner completed the individual time-trial from Fiera Milano (Rho – Pero) to Milan in 30’13” at the average speed of 51,627 km/h. Alex Rasmussen (HTC – Highroad) was second after 7” and Alberto Contador (Saxo Bank Sungard) third after 36”. The Maglia Rosa and Maglia Rossa, Alberto Contador: "This win is amazing, it looked easy but was actually very difficult. A big thanks to my family, my friends, my team and the fans." The Maglia Verde, Stefano Garzelli: "It is a great emotion, after 11 years to still be around here with the Maglia Verde." The Maglia Bianca, Roman Kreuziger: "I managed to keep this jersey and we won the team championship. 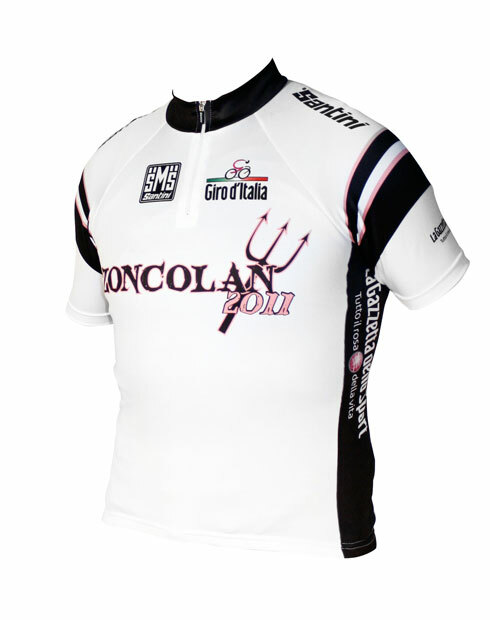 Of course I hoped to be in the top ten but if I won the Maglia Bianca means that I’m still young, right? I have time to grow and I'm sure that confronting the great champions who have fought in this Giro d’Italia has undoubtedly helped me to grow further." During the award ceremony for Alberto Contador a wrong version of the national Spanish anthem was played. Spanish Sport General Director, Matilde Garcia Duarte, issued an immediate formal complaint. 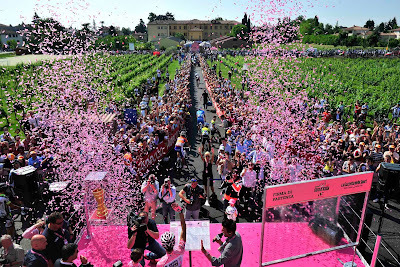 The management of the Giro d'Italia responded by apologizing to Alberto Contador, the Spanish Government, Spanish authorities attending the event, and all Spanish citizens. And, so ended the 94th edition of the Giro d'Italia. 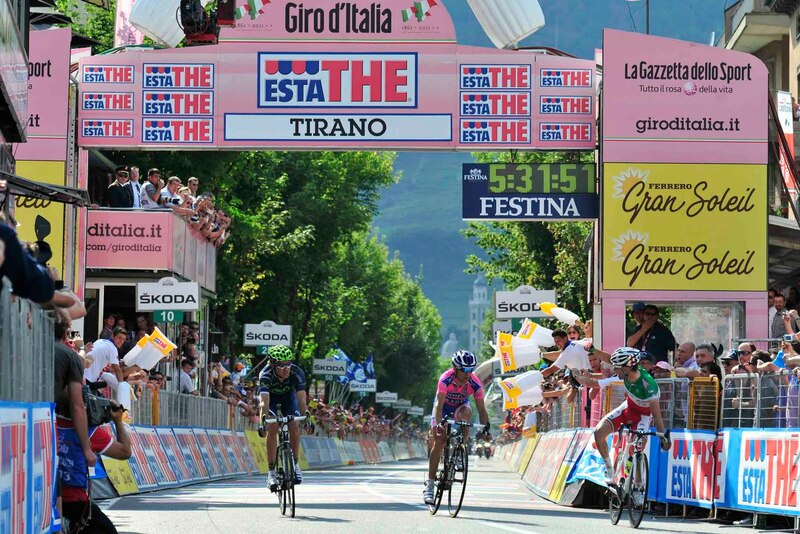 Vasili Kiryienka (Movistar Team) won the twentieth stage of the 94th Giro d’Italia. The winner completed the route in 6:17’03” at the average speed of 38,509 km/h. José Rujano Guillen (Androni Giocattoli) was second at -4:43 and Joaquin Rodriguez Oliver (Katusha Team) third at -4:45. Scarponi added another 22 seconds over his GC lead of Nibali. 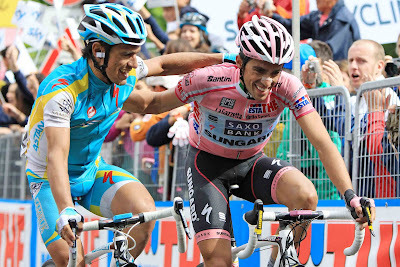 Alberto Contador (Saxo Bank Sungard) is the Maglia Rosa Estathé, 5’18” ahead of Michele Scarponi (Lampre – ISD) and 6’14” ahead of Vincenzo Nibali (Liquigas – Cannondale). Stefano Garzelli (Acqua & Sapone) is the Maglia Verde Banca Mediolanum. 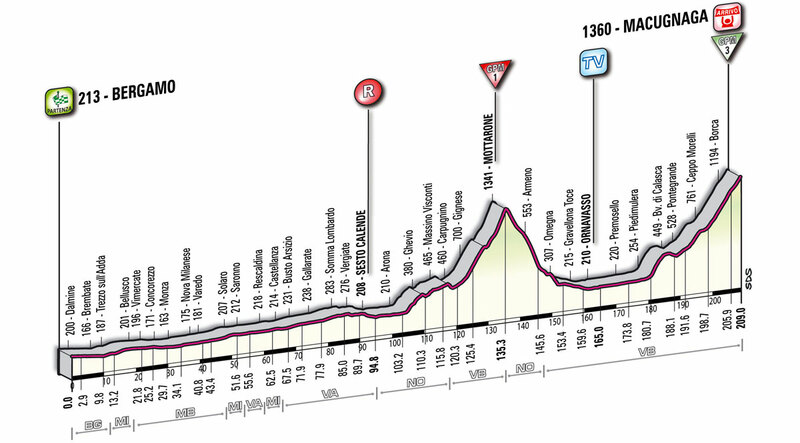 Stage 21, Sunday, will be an individual time trial to conclude the 2011 Giro d'Italia. See here for latest details regarding the modified route. 162 riders roll out at 11.25 am. 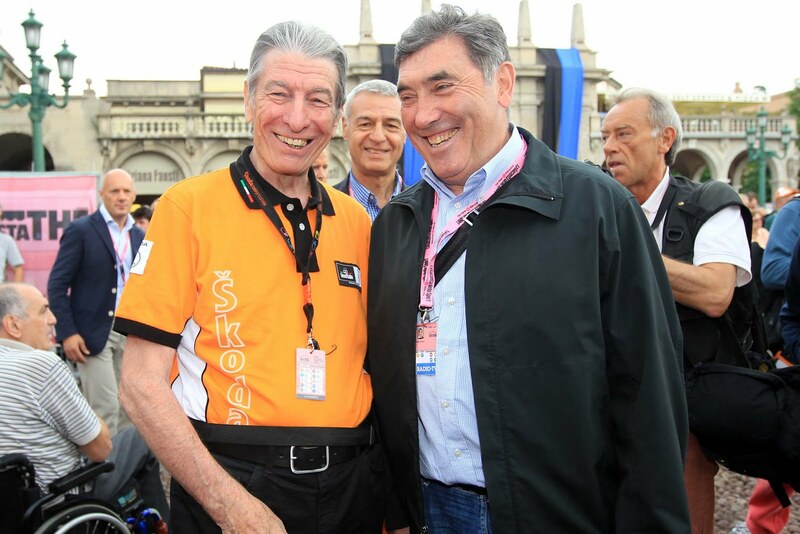 Felice Gimondi and Eddy Merckx are enjoying the race. After 4 km 19 riders get away: Dessel, Ermeti, Beyer, Sasma, Azanza Soto, Cheula, Brutt, Caruso, Spilak, Samoilau, Kiserlovski, Favilli, Van Winden, Didier, Carlstrom, Stetina, Popovych, Rovny and Hoogerland. The bunch, paced by the Acqua & Sapone and Farnese Vini – Neri Sottoli riders, does not leave much room: at km 14 the field is 26” back. The breakaway is caught at km 28. At km 48, Bak, Rabottini and Pineau fly off; the field does not respond. Average speed after one hour: 50.200 kph. At km 54: the leaders have a 2’05” lead. The three front-runners do not cooperate and Pineau decides to launch an attack on the two other. At km 60, the QuickStep rider has a 38” lead over Bak and Rabottini and 6’25” over the peloton. Pineau decides to wait for the two chasers and, at km 68, the three are at the front together. Average speed after two hours: 45,900 kph. In Vergiate – km 92 – the break reaches a 11’50” lead. 100 km to go: the field is closing the gap down to 7’30”. 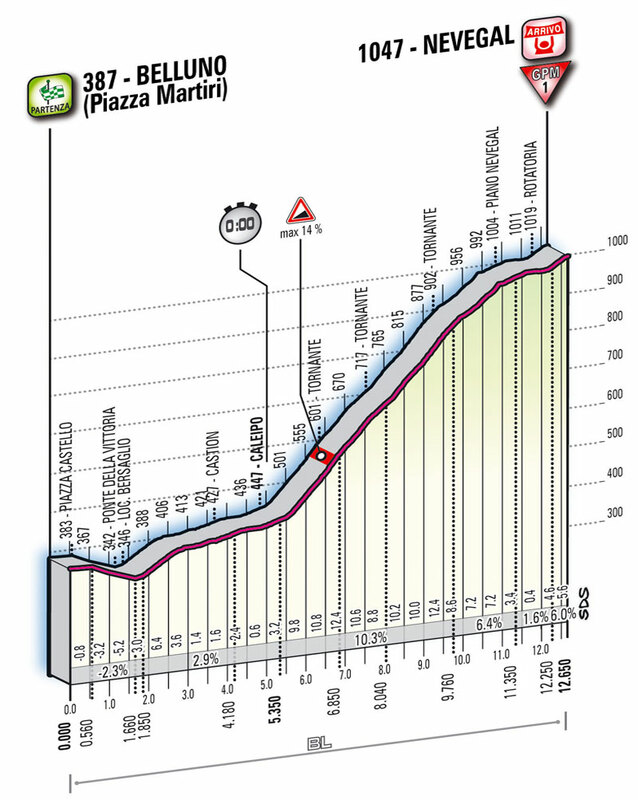 At the beginning of the climb to the Mottarone the bunch, paced by Acqua & Sapone, is 5’ behind. Average speed after three hours: 41,600 kph. Almost at the end of the ascent Garzelli (the oldest rider in the Giro) jumps away from the peloton as the chasers are approaching the break. King of the Mountain – 1st category, Mottarone (VB) [m 1.341]: Pineau comes over the climb ahead of Rabottini and Bak, Garzelli 26” behind, with the main bunch at 1’10” . On the downhill Grazelli, then Chenel and Tschopp catch the three escapees. 6 men are leading now. 50 km to go, 3’35” of delay for the bunch, paced by the Katusha riders. Intermediate Sprint, Ornavasso (VB): Bak first to cross the IS, ahead of Tschopp, Garzelli, Pineau, Chevel, Rabottini. The bunch pass 2’22” later. The last climb leading to the finish line begins. Bak is suffering, 5 men are left to lead. Di Luca is guiding the chasing group with the Pink Jersey. 25 km to go: Pineau and Rabottini accelerate, the rest of the break is caught by the bunch. With 20 km to go, 36” of lead. 13 km to go: Pineau and Rabottini are caught by the field – 50 riders approx. – which is always paced by the Team Katusha riders. The Green Jersey, Garzelli, in difficulty. 6 km to go, Tiralongo accelerates. With 5 km to go, the Astana rider has an 11” lead over the Pink-Jersey group. – 3 km: 20”. Dupont jumps out with Rodriguez, on his wheel, who leaves the French rider behind and chases Tiralongo. Last km: sprint by Contador who catches and passes Rodriguez and joins Tiralongo - 400 metres. Contador has a few words with Tiralongo and rides to the line with his former teammate from Astana. Together they fly to the finish line. 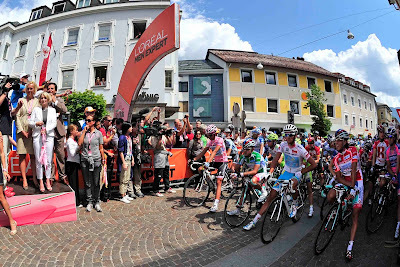 FINISH – KOM – 3rd category, Macugnaga (VB) [m 1.060]: Paolo Tiralongo wins the stage ahead of Alberto Contador, Vincenzo Nibali in third 3” behind. Time of the winner: 5h 26’ 27” at an average speed of 38.413 kph. 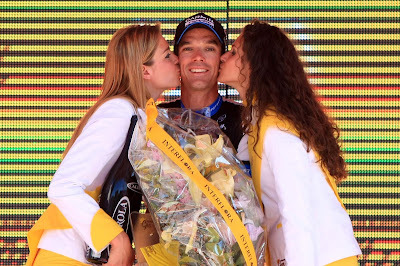 Tiralongo: "After a life (12 seasons) as a domestique, I’ve finally reached my goal of winning a race. My wife sacrifices so much for me to live this life as a cyclist. 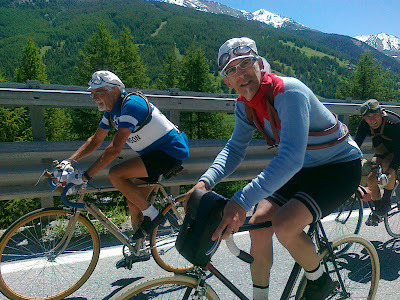 It was Alberto who suggested to me to attack with six kilometres to go. He touched my shoulder to give me the signal. He had seen my motivation before. I had tried to go away once before. This was my only week of freedom. Otherwise, I always give 100% for my captains. I can imagine that 90% of the riders are very happy that I’ve won today after seeing me racing for my captains for such a long time. The first of them is Contador. When I saw him coming across to me, I saw a friend, not a rival. I knew he would do what he could to make me win this stage." Alberto Contador (Saxo Bank Sungard) is the Maglia Rosa Estathé, 5’18” ahead of Michele Scarponi (Lampre – ISD) and 5’52” ahead of Vincenzo Nibali (Liquigas – Cannondale). Stage 20: here for more details. On hand for tomorrow: the Colle delle Finestre, 18 km, 45 switchbacks, and slopes of more than 12% (9.2% average); last 8 km are gravel. 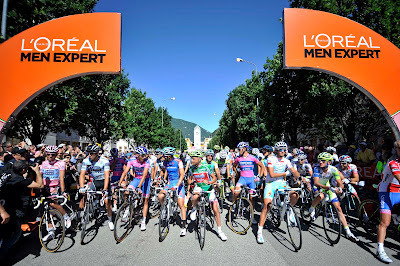 Stage 18, Thursday, May 26, 2011, MORBEGNO – SAN PELLEGRINO TERME, 151 km. 162 riders roll out at 1.25 pm. Right away a very high speed but the field is always together. After 50 km from the start, the whole bunch is still together. Average speed after one hour: 53.100 kph. A number of attacks on the front of the field. Agnoli asks for a “time out”. Unheard. The accelerations keep on going. On the steep uphill leading to Bergamo Alta the peloton is split into three groups. Intermediate Sprint, Bergamo: Bakelandts crosses the IS first ahead of Tankink and Pinotti who lead the first group (50 riders) including the Pink Jersey. The main bunch has a 1’ delay. In Alzano Lombardo, km 96, 20 riders clear out (Vicioso, Brambilla, Sastre, Kozontchuk, Pinotti, Losada, Capecchi, Pasamontes, Bakelandts, Tiralongo, Gatto, Cataldo, Pineau, Seeldrayers, Hernandez, Tankink, Navarro, Downing, Deignan, Carrara). Average speed after two hours: 50.800 kph. 50 km to go: 3’22” lead for the 20 breakaway riders over the first chasing group. On the front 6 riders attack; at km 103, Pinotti, Capecchi, Seeldrayers, Pineau, Downing and Brambilla are the leaders. On the uphill leading to the Ganda Pass, Pineau, Downing and Brambilla lose contact. Three men are now leading the race. King of the Mountain, 2nd category : Passo di Ganda (BG) [m 1.060]: Pinotti first to come over the climb ahead of Capecchi, Seeldrayers, Brambilla 15” behind, Tiralongo 1’25” behind. The latter flies off in the pursuit of the front-runners on the phill. The Pink-Jersey group gets to the top 4’55” behind. On the downhill Tiralongo joins Brambilla but the three leaders cannot be caught and the victory is at stake between them. Last km: a phase of mutual scrutiny among the three breakers - Pinotti has Seeldrayers and Capecchi on his wheel. From the last bend – 250 metres to go – Pinotti starts off the sprint. It is Eros Capecchi who passes and snatches the win ahead of Marco Pinotti, in second. Kevin Seeldrayers in third. In fourth and fifth, at 1’20”, Brambilla and Tiralongo respectively. The first victory for Liquigas in this Giro. Time of the winner: 3h 20’ 38” at an average speed of 45.157 kph. Capecchi: "I waited and tried for a long time now. To succeeded in the finish of a race is important, it's like a dream come true. Yesterday I tried to find the right breakaway group, unfortunately without success. I felt that my legs felt very well compared to previous weeks and today I threw myself into the race without hesitation. It's been a grind. The Ganda Pass was a perfect springboard for the group split up, then Seeldraeyers, Pinotti and I jockeyed to win. I chose the right time." Alberto Contador (Saxo Bank Sungard) is the Maglia Rosa Estathé, 4’58” ahead of Michele Scarponi (Lampre – ISD) and 5’45” ahead of Vincenzo Nibali (Liquigas – Cannondale). Stage 19, Bergamo-Macugnaga, 209 km is rated "Alta Montagna". Sunday, May 29th, the final stage will take place in Milano with an indivdual time trial. The stage has been modified with the start now being in the vicinity of the Fiera Milano of Rho-Pero rather than Piazza Castello. The finish, at the Duomo of Milano, remains the same. The first rider will go off at 1420, the last rider to arrive at the finish is anticipated at 1730. The new course will be 26 km, the original was 32.8 km. The highly creative inspiration of artist Marco Chiurato, and the experience and technology offered by former cycling champion Giovanni Battaglin. Fukushima 131 is a truly unique bicycle resulting from a combination of the talents of two men from Marostica, both sharing the same desire to do something concrete but also symbolic for the people of Japan struck by the tsunami and the nuclear risk. Thanks to the collaboration of the Euromobil firm, which backed this humanitarian cause by displaying the work at the 2011 Milan International Furniture Show and making it known, it will be possible to put the Fukushima 131 up for auction in order to raise funds for Japan. Apart from the financial contribution made possible, the purpose of this initiative is to keep public opinion well-aware of the consequences Japan is still suffering as a result of the environmental disaster, with particular reference to the children. The red circle at the bottom represents the Japanese flag but also, metaphorically, the devastated territory and the suffering of the people struck by the tsunami. The same red dot becomes visible on the frame of the bicycle, deformed by a superior force like that of Nature. The bicycle also bears a number, and namely that of “iodine 131”, the radioactive threat overhanging the people of Japan. Which becomes a warning to all mankind. Fukushima 131 does not bear any kind of logo, but only the signatures of Giovanni Battaglin and Marco Chiurato. 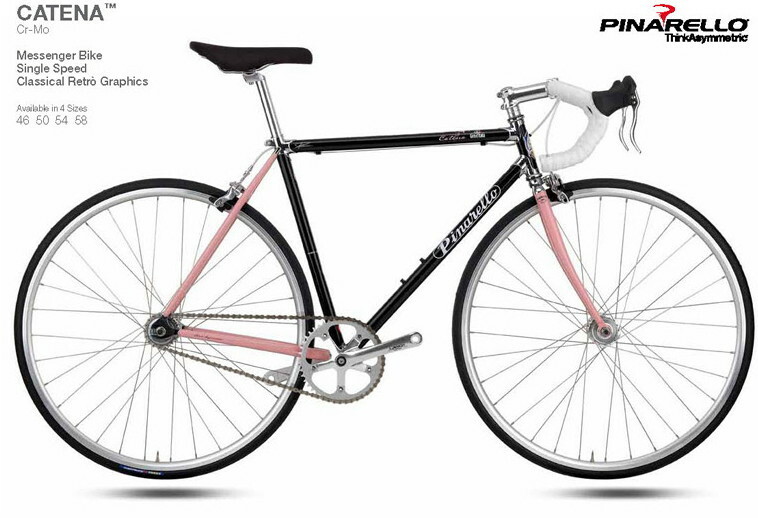 The proceeds from the sale of the bicycle will go to the Italian Red Cross "Pro emergenza Giappone". Starting Bid: €20,000.00, bid here. 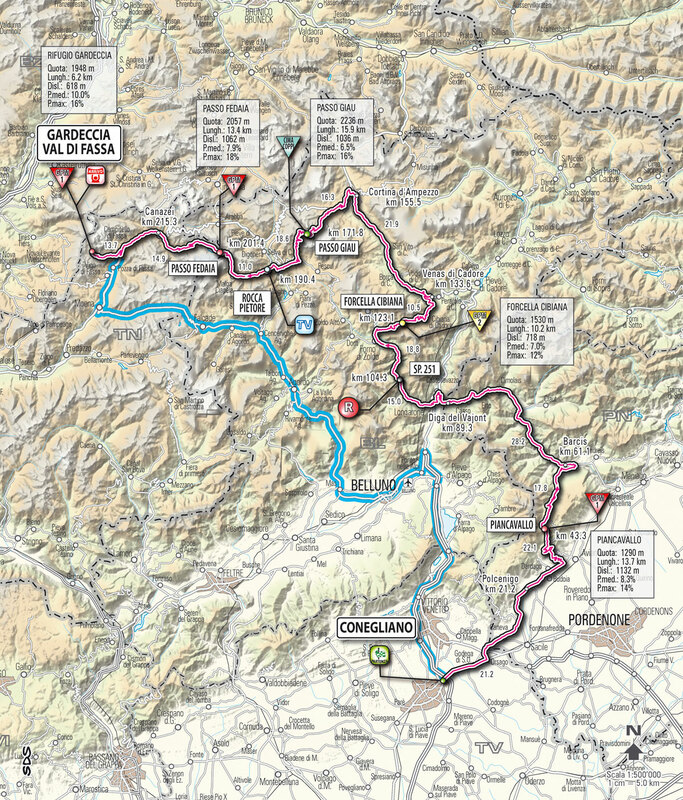 Stage 17, Wednesday, May 25, 2011, FELTRE-TIRANO, 230 km. 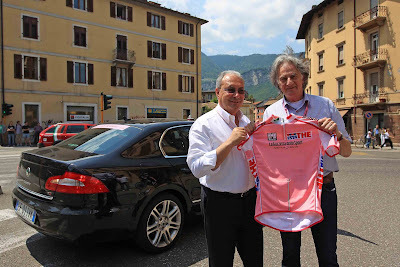 The Giro's guest of honour: the English designer Paul Smith, a great cycling fan, fulfils today the desire to live a Giro stage among the riders. At the passage of the athletes from Trento, Sir Smith will “enter the race" in the car of the Giro d’Italia Director Angelo Zomegnan. At 11.20 am, 164 riders (non starting: Masciarelli) roll out. Average speed after one hour: 47.900 kph. At km 52, 15 riders clear out: Taborre, Gastauer, Frank, Sivstov, Vorganov, Losada, Ulissi, Lastras, Bakelandts, Kiserlovski, Giordani, Engels, Hernandez and Le Mevel. At km 60, the 15 riders are chased by Dupont 55” behind and the bunch 3’ behind - Dupont catches the break 10 km later. 16 riders on the front. 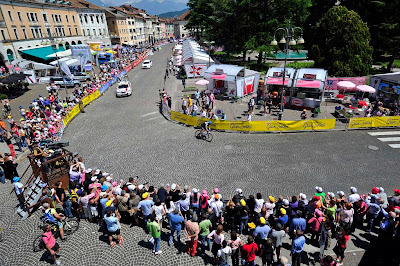 In Trento, km 80, the breakaway has a 4’30” lead. In Lavis: 4’30”. Average speed after 2 hours: 46.200 kph. In Cles – km 120 – the field is 6’50” behind. With 100 km to go the breakaway has a 7’35” lead over the bunch. Average speed after three hours: 43.200 kph. At the beginning of the climb to the Passo del Tonale the bunch, paced by the Liquigas – Cannondale riders, reduces the gap: 5’45”. King of the Mountain, 2nd category: Passo del Tonale (BS) [m 1.883]: Gastauer is first over the climb ahead of Dupont, Bakelandts and the rest of the breakaway but Giordani and Engels lost contact: a 14-man break. The field is 6’10” back. Intermediate Sprint: Edolo (BS): Bakelandts gets the IS ahead of Sivstov, Lastras and the other leaders. The gap is going down and the bunch, paced by the Geox – Tmc riders, crosses it 3’55” behind. On the uphill to the Aprica, with 25 km to go, the field chase the breakaway 3’42” behind. Attempted and failed accelerations on the front. Le Mevel is suffering. 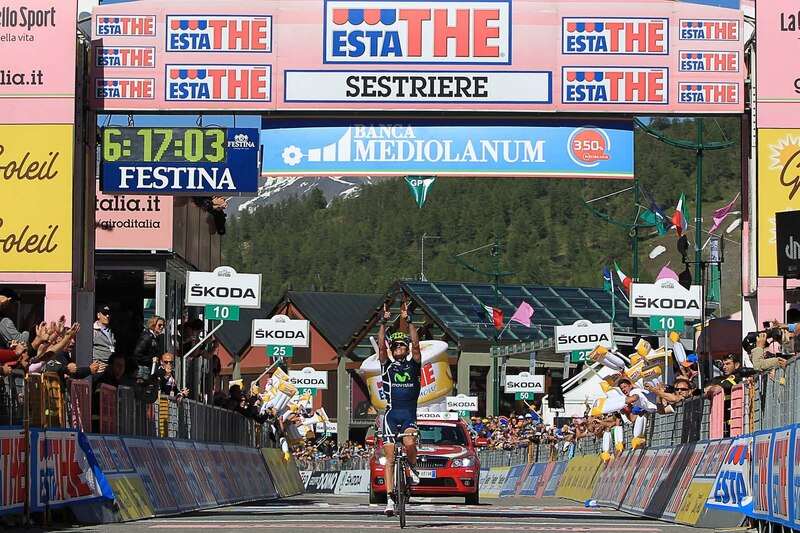 King of the Mountain – 3rd category, Aprica (SO) [m 1.173]: Lastras first followed by Visconti, Siutsu, the rest strung out. 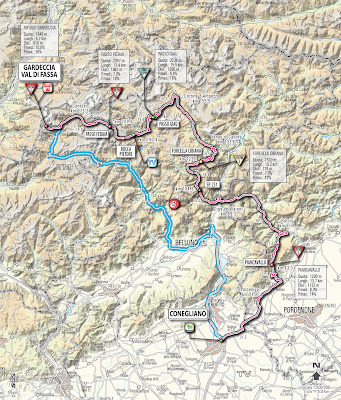 The bunch, paced again by the Liquigas – Cannondale riders, has a 3’40” delay on the top of the mountain. On the downhill Lastras is leading. Nibali on the front of the chasers. 10 km to go, the breakaway keep a 3’10” lead. 3 km to go, Lastras, Ulissi, Bakelandts and Visconti. Last km: the 4 riders fight for the win. Ulissi accelerates, Visconti comes from the right to pass Ulissi along the left close to the barriers; Lastras on the other side of the road. Visconti shoves Ulissi out of his line twice. Giovanni Visconti takes the win at the foto finish ahead of Giovanni Ulissi and Pablo Lastras. The Panel of Commissaires, after watching the film of the race, relagate Giovanni Visconti from the first to the third place. 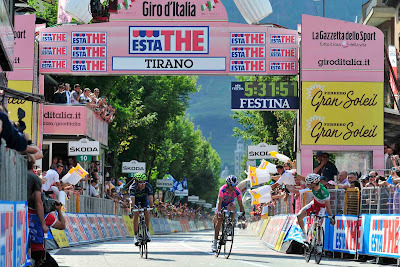 Therefore, 22 year old Ulissi ((Lampre - ISD) wins the stage ahead of Lastras. The Italian Champion in third. Time of the winner: 5h 31’ 51”, at an average speed of 41.585 kph. Ulissi: "I'm so happy, I can't believe I won a stage in Giro d'Italia. I knew that the stage was suitable for the breakaways, so I paid attention in the first part of the race. I joined in a good action, then I managed my energies. In the sprint, I think that I did no harm and that I deserve the victory". 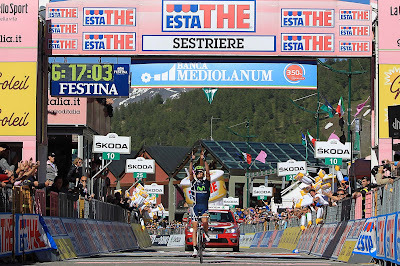 Alberto Contador (Saxo Bank Sungard) is the Maglia Rosa Estathé, 4’58” ahead of Michele Scarponi (Lampre – ISD). 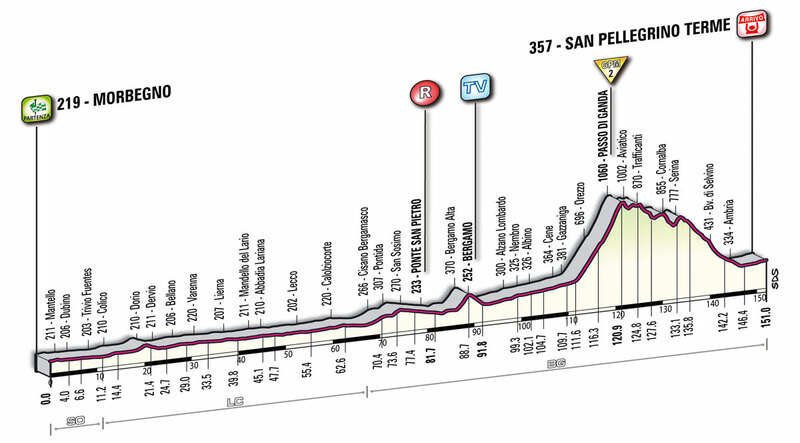 Stage 18, Morbegno-San Pellegrino Terme, 151 km is rated "Pianeggiante". The stage was preceded by a minute's silence in memory of Xavier Tondo Volpini, the Spanish Movistar Team rider who died at home yesterday in a freak accident involving his garage door. Alberto Contador (Saxo Bank - Sungard) won the 16th of the 94th Giro d’Italia. Contador completed the uphill time-trial from Belluno to Nevegal in 28’55” at the average speed of 26,351 km/h. 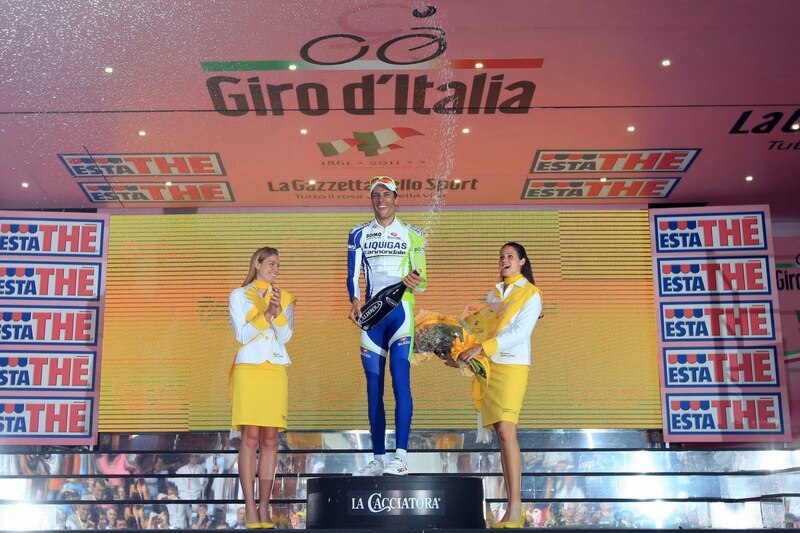 Vincenzo Nibali (Liquigas – Cannondale) was second in 29’29” and Michele Scarponi (Lampre – ISD) third in 29’33”. Faustino Muñoz, Contador's mechanic on Saxo Bank, was expelled from the race today. The Spaniard, already furious at the end of the Zoncolan stage with the fans along the climb for insulting and spitting on Contador, opened the car door on purpose to hit a spectator. For this uphill TT Scarponi rode his Wilier Superleggera with a medium profile front wheel and a high profile rear wheel; gearing 50-36 with 11-27. Once again Contador proved he is the strongest rider in the Giro, this time winning the TT by 34 seconds over Nibali and 38 seconds over Scarponi. It appears Contador has an insurmountable lead. Nevertheless, the race for 2nd is an especially important one this year. At the moment only 47 seconds separate Scarponi (2nd) and Nibali (3rd). 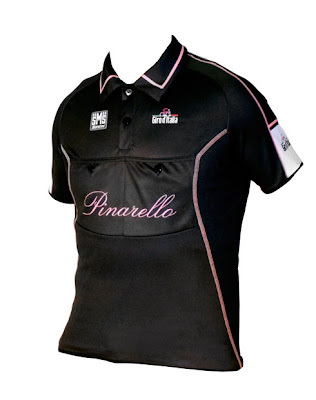 The elephant in the Giro is the "Contador Problem". The Court of Arbitration for Sport (CAS) hearing will take place in June in Lausanne, a decision will be reached before the start of the Tour de France. If the Court of Arbitration for Sport decides in favor of the UCI, and if Contador receives a one year ban, all the victories back to July 21, 2010 would be stripped, including the 2010 Tour de France and this Giro d'Italia. 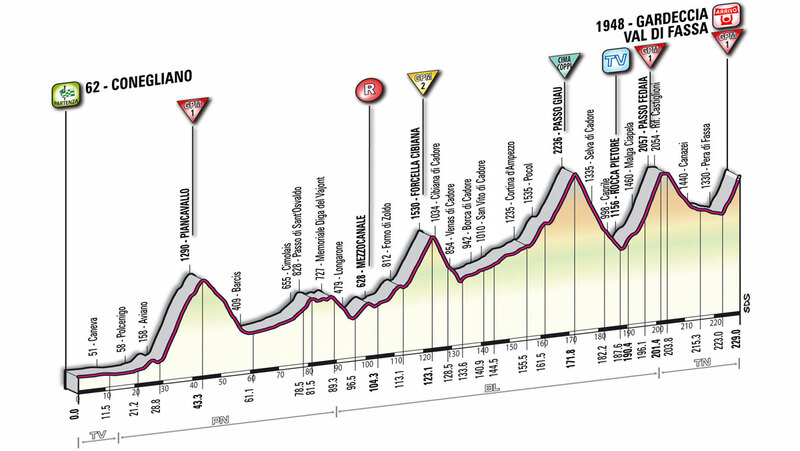 Stage 17, Feltre-Tirano, 230 km, is rated "Alta Montagna". 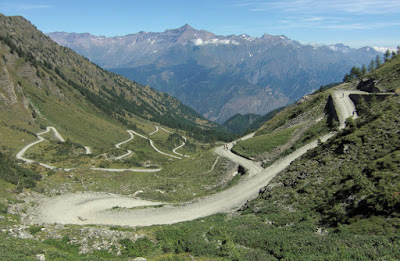 Perhaps Nibali, with his excellent descending skills, will attack on the long Passo del Tonale descent. Florence's first alleycat will take place June 4th. 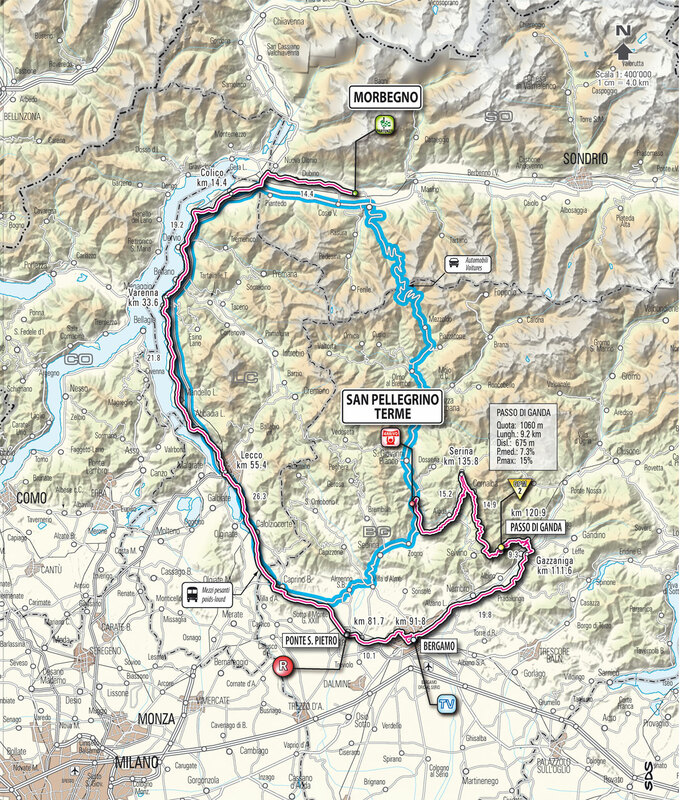 Stage 16 for tomorrow will be a 12.7 km individual time trial from Belluno to Nevegal. During today's rest day Nibali, currently 3rd, commented, "It will be faster than the Plan de Corones time trial of last year. The central part of the course will be very hard. It will be a beautiful TT." Average grade: 8.2%. Average of 10.3% for 4.4 km beginning past Caleipo. We wrote on May 1st that in honor of this year's Giro d'Italia, celebrating the 150th year of Italian unification, Pinarello will be issuing a special edition Dogma model. 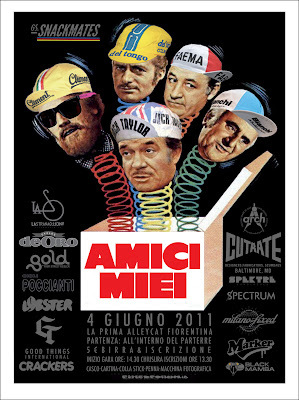 The bicycle will also feature Campagnolo's electronic gruppo, EPS (Electronic Power Shift). 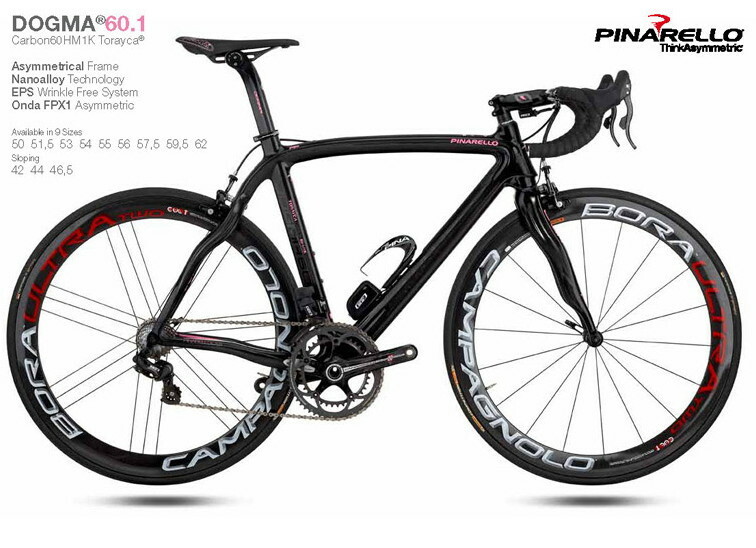 Pinarello's authorized dealer in Pretoria, South Africa, ASG Solutions, has these photos up of the special edition Dogma plus other models including the new "Catena". Double click on photo to enlarge. If anyone has more information please write in to email address below. At 10:19 am 172 riders(not starting: Hunter) roll out for the stage in the Dolomites. At km 10, Sella and Hoogerland break away. In their pursuit Aramendia, Kuschynski, Kaisen, Seeldrayers and Popovych. At km 28: 7 escapees. At the beginning of the climb towards Piancavallo, Kaisen is dropped. 11 riders clear off the bunch: Garzelli, Tschopp, Pirazzi, Nieve, Sastre, Di Luca, Losada, Pasamontes, Petrov, Weening and Deignan. Average speed after one hour: 34.800 kph. 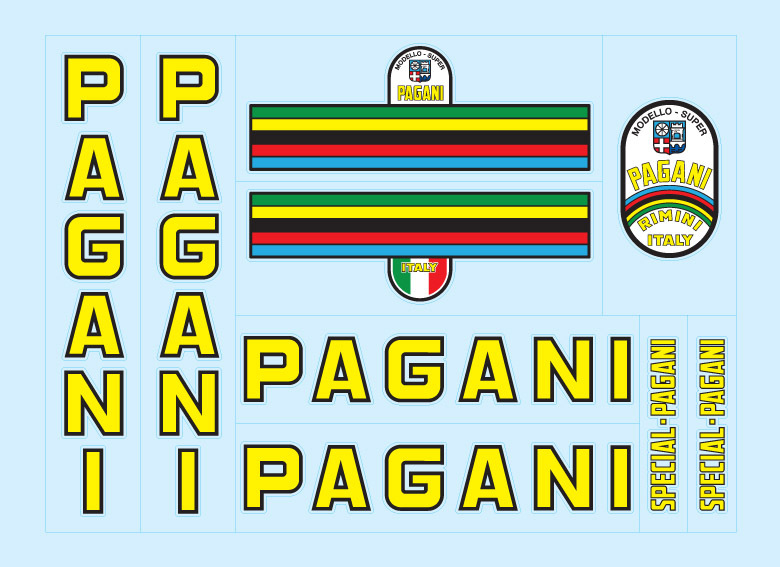 King of the Mountain – 1st category, Piancavallo (PN) [m 1.290]: Sella 1st at KOM, with Hoogerland, Popovych and the other three members of the break. The 11 chasers come over the climb 18” behind . The field is at 3’30” and Baakelandtss anticipates it. The latter catches the 11 riders and together they join the leaders. At km 62: 18-man break. Average speed after two hours: 34.400 kph. 150 km to go: 9’20”. Average speed after three hours: 34.600 kph. King of the Mountain – 2nd category, Forcella Cibiana (BL) [m 1.530]: Garzelli, Sella, Hoogerland and the other 15. The bunch is 9’05” behind paced by the Liquigas – Cannondale riders. 100 km to go, the bunch is 8’30” behind. 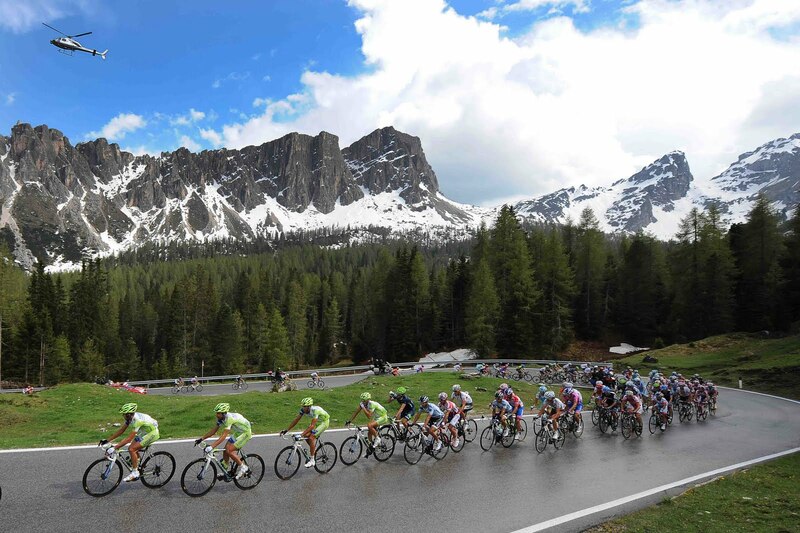 In Cortina d’Ampezzo, where the ascent towards the Passo Giau begins, the 18-man breakaway have a 10’10” lead. On the uphill Hoogerland jumps out and gains some terrain. The chasing group string out. Garzelli and Nieve in pursuit of Hoogerland. The rest of the group does not keep up the pace. Garzelli catches and passes Hoogerland. King of the Mountain – Cima Coppi, Passo Giau (BL) [m 2.236]: Garzelli is 42” ahead of Nieve, and 2’15” ahead of Hoogerland. The rest of the chasing group, paced by Di Luca, reaches the top 1’43” behind. The bunch, led by Rodriguez, Arroyo, Contado, Rujano and Nibali, has a 9’35” delay. On the downhill, Nibali accelerates with Contador and Arroyo chaing him. Intermediate Sprint, Rocca Pietore (BL): Garzelli first with 1’16” over Baakelandts and Nieve. Seeldrayers 2’05” behind. At 2’20” Sella and Di Luca. 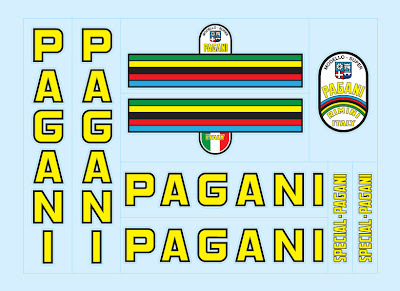 At 2’40” Petrov; at 3’ Pirazzi; at 3’12” Weening, Degnani and Hoogerland. At 3’50” Sastre and Tschopp; at 5’15” Pasamontes; at 6’05” Popovych. Nibali is now 8’25” down on Garzelli. The Pink-Jersey group is 8’53” behind. Uphill again: on the ramps of the Fedaia Pass, Nibali sits up and is back in the Contador group. Arroyo pulls away from this group and gains a few seconds. Contador takes off, Rujano and Kruijswijk go with him. Nibali is in difficulty. King of the Mountain – 1st category, Passo Fedaia (BL) [m 2.057]: A lone Garzelli with a 40” lead over Nieve and 3’10” over Bakelandts. Sella is 4’22” back, Seeldrayers 6’. 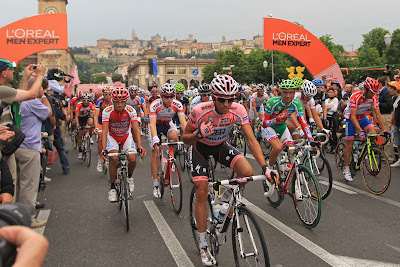 The Pink Jersey group (with Gadret, Rujano, Menchov, Rodriguez, Scarponi, Arroyo, Kreuziger) is 6’35” behind. Nibali comes over the climb 7’35”. The Liquigas rider catches the Pink Jersey group at the very end of the downhill. With 10 km to go: Garzelli, Nieve 20” and Bakelandts 3’25” back. Sella 5’48”. The Pink Jersey group is t 6’35”. 7 km to go, Nieve catches and passes Garzelli at the start of the final ascent. Contador attacks and gains some terrain. At his chase: Scarponi and Gadret. Last km: Nieve has 1’ lead over Garzelli. FINISH – KOM 1st category. Rifugio Gardeccia (TN) [m 1.948]: Mikel Nieve Ituralde (Euskaltel - Euskadi) wins this stage ahead of Stefano Garzelli at 1’41”. Contador in third at 1’51” and Scarponi in fourth at 1’57”; Scarponi moves into 2nd place ahead of Nibali at 4’20”. Time of the winner: 7h 27’ 14”, at an average speed of 30.722 kph. Contador: "It was a hard day, really hard. I think it was the hardest stage of my career. We've suffered a lot in the last few days." 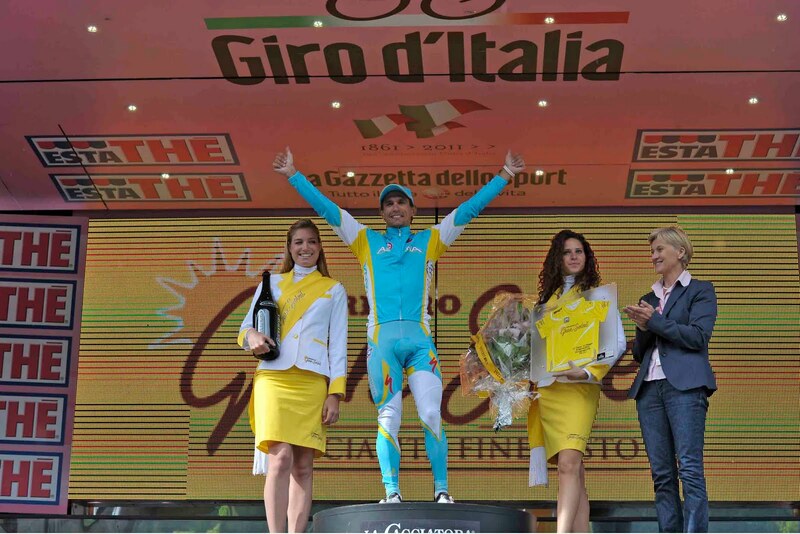 Scarponi: "I'm satisfied, this was a good day for me. I think that this was a very tough stage but I faced it pedaling with regularity and this was the best choice that allowed me to be competitive in each moment of the race. Now I'm second in the overall standing, but I know that there will be a last week of Giro that will be tough. I'm sorry that my team mate Marzano had to quit the race because of temperature (fever): he was very important for me and I want to thank him for what he has done until now". Alberto Contador (Saxo Bank Sungard) is the Maglia Rosa Estathé. 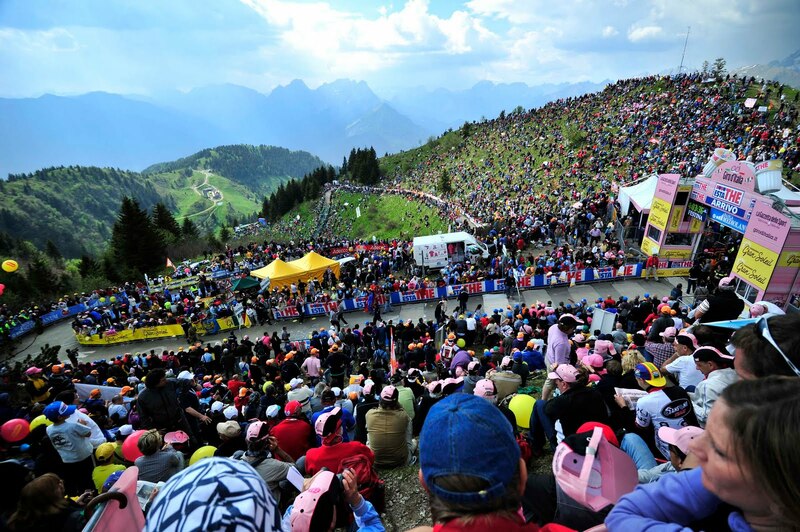 Stage 14, May 21, 2011, LIENZ-MONTE ZONCOLAN, Mountain stage with summit finish, 190 km. The stage was originally 201 km but the race ommissaires decided to cut the penultimate Monte Crostis ascent and descent out. 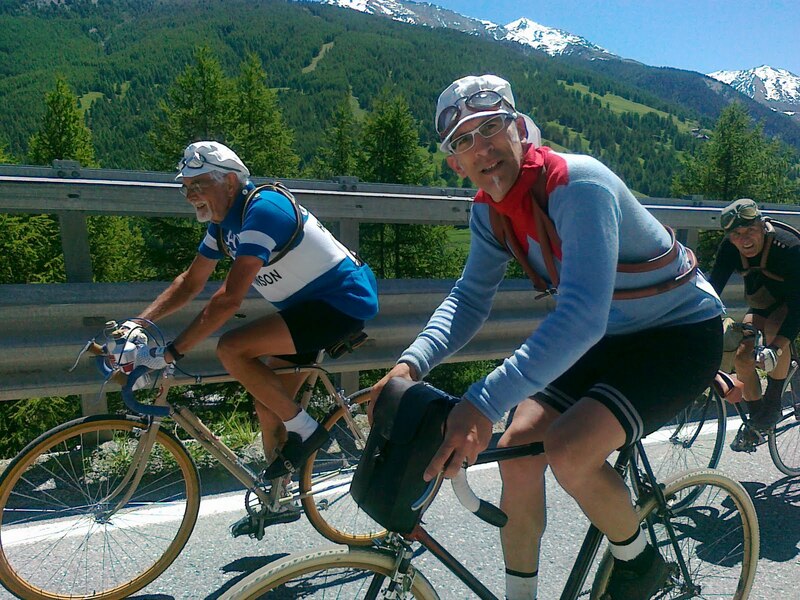 176 riders start out from Lienz at 12:02 pm. Fast pace from the beginning with several breakaway attempts on the front of the bunch. At km 29, Brambilla, Rabottini and Tankink manage to clear out. The field lets them go and after 5 km the three escapees have already a 1’ lead. Average speed after one hour: 41,900 kph. The gap between the break and the peloton increases; at km 50: 9’20”. King of the Mountain - 3rd category, Passo di Monte Croce Comelico (BZ) [m 1.636] – km 54: Brambilla first, followed by Rabottini and Tankink. The bunch, where Tosatto from Saxo Bank – Sungard sets the pace, comes over the climb 10’05” behind. Brambilla over Tankink and Rabottini. The peloton with Savini on the front, gets there with a 10’32” delay. Average speed after two hours: 38,200 kph. In Lorenzago di Cadore, km 88, the lead of the three-man break is of 10’35”. Brambilla first over the climb again before Rabottini and Tankink. The delay of the field, anticipated by Kiserlovski, is 10’32”. With 75 km to go: 9’55”. Intermediate sprint, Villa Santina (UD) – km 139,9: Rabottini crosses the intermediate sprint line first ahead of Tankink and Brambilla. The bunch gets there at 9’05”. At the front the Liquigas riders are pacing the bunch. Parcours deviation called during the race. The King of the Mountain of Tualis is cancelled. Once the race reaches the bridge of Muina, it turns left towards Cella and Luincis. 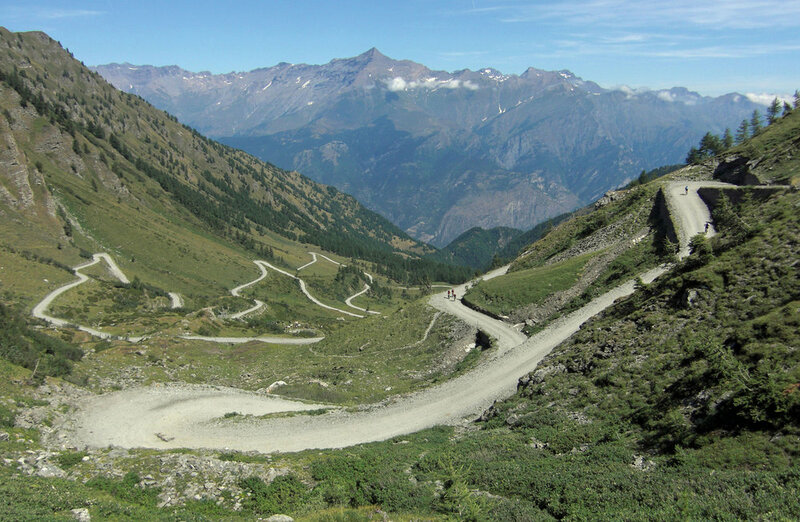 Once it reaches the SS of Val Pesarina, it goes to Ovaro to rejoin the original race parcours and climb on the Monte Zoncolan. The escapees attack the last 10-km climb with a lead of 3’50” over a first group, made up of some 40 riders – paced by the Liquigas riders. The main bunch is at 4’50” behind. 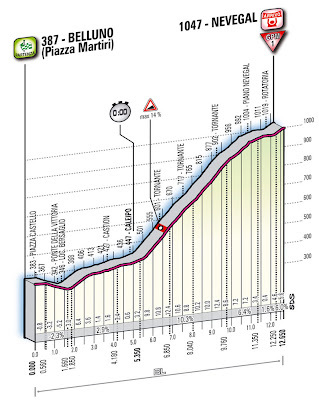 On the first ramps of Zoncolan, Rabottini and Tankink are dropped; Brambilla rides solo at the front of the race. Progression of Rodriguez first and then Anton, followed by Contador. The Pink Jersey catches Anton and together they go in pursuit of the leaders. Contador and Anton catch Rodriguez with Scarponi and they attack. At the front of the race, Tankink catches Brambilla and is leading solo. New attack of Anton that gets ahead of Rabottini, Brambilla and Tankink. 5 km to go: Anton is leading; at 5” behind Contador and Scarponi; at 18” behind Nibali and Rujano and Menchov. Nibali catches Contador and Scarponi. Scarponi is suffering. Two riders in pursuit of Anton. 2 km to go: Anton has a 30” lead over Nibali and Contador, 45” over Scarponi; at 1’02” Menchov and 1’28” Rujano. Before the banner indicating the last km, Contador accelerates - Nibali is dropped – and Contador jumps to chase Anton. third at 40”. Fourth, Scarponi at 1’11” ahead of Menchov at 1’21”. Time of the winner: 5h 04’ 26”, at an average speed of 33.899 kph. Nibali: "I looked at doing everything I could to win the stage. I felt good today, better than yesterday, and my teammates also felt good, with the exception of [Sylvester] Szmyd who is still sick. If not, it could have been a different outcome. We tried because this is a climb I know very well. I followed a regular rhythm and I accelerated later to drop Scarponi. I’m not an explosive climber. Unfortunately, Anton was in the front and we didn’t manage to catch him. I did everything I could." Scarponi: "Contador and Nibali were a little more brilliant then me, but I succeeded in limiting the gap". Alberto Contador (Saxo Bank Sungard) is the Maglia Rosa Estathé with 3’20” advantage on Vincenzo Nibali (Liquigas – Cannondale) who is second in the overall ranking. Alberto Contador (Saxo Bank Sungard) is the Maglia Verde Banca Mediolanum. 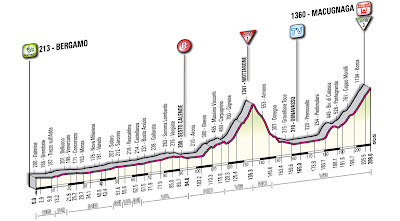 Stage 15, Conegliano-Gardeccia/Val di Fassa, 229 km, is rated "Alta Montagna". 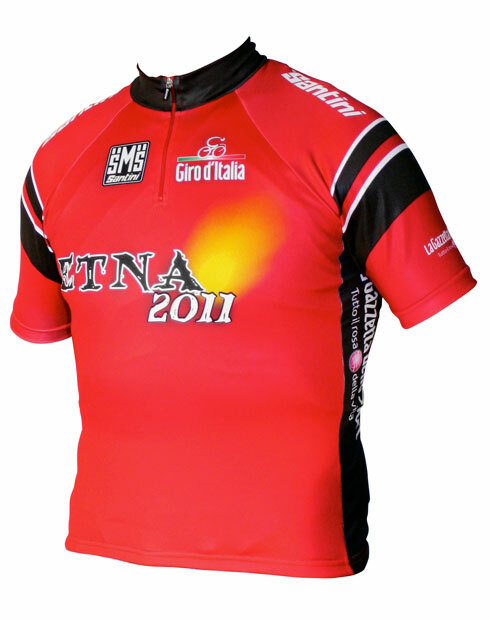 The Zoncolan jersey on the back says "Welcome to Hell"
The Etna jersey on the back says "Light My Fire"
The Pinarello jersey on the back says "Maglia Nera 1951"; see related story here.